I’ll be sharing one photo of my trip every week until I head out to Montana once again. I guess I look at it like my way of holding a protest, or going on strike, until I get my way and I depart for Big Sky Country. Along the way, I will try to give everyone some information and other tidbits about each photograph. So come along and join me in my protest! After photographing the Paradise Local near Quinns, we made our way east. We stopped in Missoula for a quick check of Montana Rail Link's yard and diesel servicing area. Not too much there, so we continued on. Since MRL had a lengthy work window on Mullan Pass that day, we figured we could highball east and not miss any trains. We also decided to go through Butte instead of Helena on our way toward the Three Forks and Lombard area. Earlier, we had been tipped off that a BNSF ballast train might be loading up at Pipestone (east of Butte). Pipestone Quarry lies at the eastern foot of the spectacular Homestake Pass line, a former Northern Pacific route to Butte that once hosted NP's famous North Coast Limited. The pass is full of photogenic features, such as tunnels, a trestle, and cool rock formations. If you've ever driven Interstate 90 over this pass, you know what I mean. Unfortunately, the line, which BNSF still owns, is embargoed from a point just west of the Pipestone Quarry all the way to Butte. The last Burlington Northern train on Homestake ran in 1983. If by a miracle it were to ever open again, I would be out there quicker than a BNSF Z train to photograph it. As we glided down the foot of Homestake Pass, we spied the ballast train up on the hill. 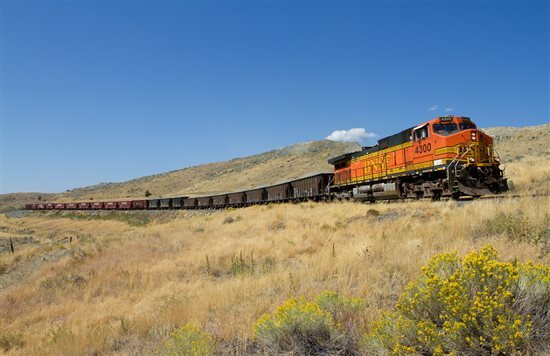 The Pipestone Quarry supplies both MRL and BNSF with ballast. With all of the flooding on BNSF’s Midwest and Great Plains routes earlier this year, and on MRL’s line, the quarry has been a busy place. The train we were after had two General Electric Dash-9s, one on each end. Up front, behind the lead Dash-9, was a cut of 10 MRL ballast cars (seven former Western Pacific, three former Santa Fe). MRL will often tag some of its own cars onto a BNSF ballast train. It takes about five minutes to load each car, and they had a substantial portion of the train to load, so after bagging a few shots, we continued east.